While I’ve never been a big fan of the characters, Winnie the Pooh has stood the test of time and with this theatrical film, it will hopefully find new fans. The movie itself is fun and wholesome for the entire family. It’s not going to challenge your mind or even break new ground in terms of… well… anything be it animation or voice talents, however I enjoyed it well enough for what it is. Plot Outline: When sad old Eeyore loses his tail, Owl sends the whole gang — Pooh, Tigger, Rabbit, Piglet, Kanga and Roo — on a wild journey to help Eeyore and save Christopher Robin from the mysterious Backson. Winnie the Pooh is based upon the works of A.A. Milne and E.H. Shepard who, as you can imagine, provided so much inspiration for Disney in a variety of works from individual TV movies and TV series throughout the decades. This movie is theatrical release from the classic characters and the first in two years since 2009’s direct-to-video release Tigger & Pooh and a Musical Too. This feature film was directed by Stephen J. Anderson who previously helmed Disney’s Meet the Robinsons and has a plethora of story writers credited including Anderson and others within the Disney (and Pixar) family. I’ve never been a particular fan of “Winnie the Pooh” be it the books, shows or movies so I’m going into this without any preconceptions. As a film, it’s a fun family affair like any standard Disney animated feature, with a lot of heart and a good story. I should note that the film is barely over an hour long, and probably just at 60-minutes without the end credits, so it’s a very short film. That said, it’s a well told story that isn’t stretched out for the sake of making it long enough to justify the cost of a movie ticket or the price of a DVD/Blu-ray. The copy I received was the DVD/Blu-ray release in DVD packaging. It comes in a standard keep case and a glossy slip cover. Winnie the Pooh and His Story Too (8:33; HD) is a quick featurette on the origins of the movie with sound bites with the crew in updating the story. Deleted Scenes (15:06; HD) – Here we get 5 deleted/alternate intros scenes that didn’t make the cut. Each is accompanied with the directors’ introduction. Bonus Shorts – You can watch the shorts of “The Ballad of Nessie” and Mini Adventures of Winnie the Pooh: “Pooh’s Balloon”, the former of which I believed played before Winnie the Pooh in theaters. The disc also contains the option to Sing Along with the Movie, Disney Song Selection and Creating the Perfect Winnie the Pooh Nursery. The release contains the DVD Copy. 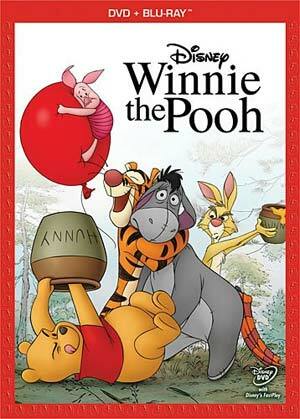 Winnie the Pooh snuggles its way onto Blu-ray with a crisp, clean and clear high-def transfer. The movie is presented in its original 1.78 widescreen aspect ratio and while the opening is live action (into Christopher Robin’s bedroom), the rest of course is animated. I noticed no signs of banding, pixilation, artifacting or other flaws that might plague a transfer. Colors are bright without looking pumped up or oversaturated. The DTS-HD Master Audio track is pretty standard and doesn’t really hold much punch, not that I expected it to. The majority of the film is filled with either dialogue or Henry Jackman’s whimsical score, otherwise it’s a fine if not above average lossless track. While I’ve never been a big fan of the characters, Winnie the Pooh has stood the test of time and with this theatrical film, it will hopefully find new fans. The movie itself is fun and wholesome for the entire family. It’s not going to challenge your mind or even break new ground in terms of… well… anything be it animation or voice talents, however I enjoyed it well enough for what it is. The Blu-ray itself is light in the features but the video is great and the audio is acceptable.